I usually share my poetry here, but thought this is the best space I have to share my other non-work creative activities. I promised a friend (hi, Meredith!) 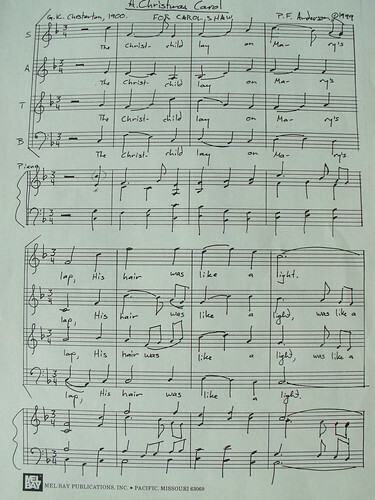 a copy of my music for my setting of GK Chesterton’s lovely Marian poem, “A Christmas Carol.” I wrote this in 1999, hoping it would be performed in 2000, which would have been the 100th anniversary of the poem. I was not able to find a group that would perform it, so it has languished in my mind since them, with me occasionally singing it to myself as I walk, as happens with most of the rest of the music I’ve written. The back story on this piece is that my friend, Carol Shaw, was ill with cancer, as it turned out a cancer that would kill her but we didn’t know that yet. She was also struggling and unhappy in some other areas of her life and going through a period of strong personal challenge and growth. One of the projects she started was learning how to work with rocks and build with them, with the goal of building a grotto and shrine to the Virgin Mary. Carol was deeply engaged in Marian traditions and faith. In a conversation with her I mentioned the origins and meaning of her name, which came from Carl and was usually used to refer to the war leader or political leader of a tribe. She was horrified. She absolutely loathed this, and had always believed her name came from Christmas Carol. In a sense, this song was partly to support her in her challenges, and partly to make up for the gaffe of the name. Carol and I were both sopranos in our local church choir. 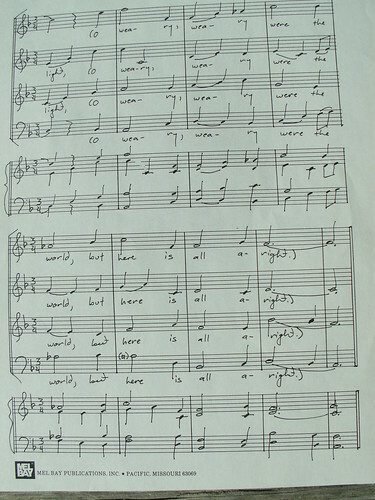 I wanted to do a piece for the choir to celebrate the Christmas connection with her name, and started looking for a song to to arrange. I wanted something with a Marian focus. I started looking and found there really are very very few carols that celebrate Mary’s role in the birth of Christ. I was very surprised. The few I found didn’t appeal to me to arrange, so I started looking for a Christmas-themed poem with a Marian flavor that would be out of copyright and appropriate to set. I hope you are as happy with what I found as I am. transparent roofs form from worn away tar. Mix and match faces with organs and limbs. Her gaze like a switchblade, pupils that loom. a dense skyline border, staccato stitched. Into the I Ching hollow of your hurt. the choice seems to be bombs. a different kind of impact. But what do I know about bombs? up of the night sky is not new at all. as a person if not the same person. a leg here or there, probably there. when men came home with no mouths. of peace, & beauty in difference. to fight in the current conflict? for whom he would give his life. a glimpse of his flank while He passed. She is a mother, balancing sheltered and shown. on what armament was used and where. have eyes to see, ears to hear, mouths to speak.